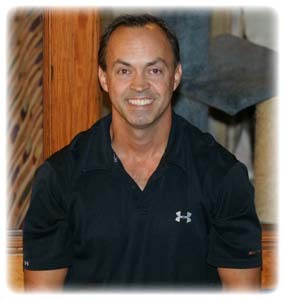 Bill Schimmel is the owner of Schimmel Fitness and an expert personal trainer. Schimmel Fitness is Bill’s vision of what a fitness center should be. “We believe once a person walks in the front door it becomes our responsibility to make sure they keep coming back.” Consistent with his vision for health and wellness, Bill built a fitness center that does not just rent space to people and wish them luck, but rather one that guides and supports every member in their fitness goals. Bill began his career as a professional fitness trainer in 1990, while attending graduate school at Miami University. To help pay school bills he worked at Bally’s Scandinavian in Cincinnati as a personal trainer. During that period, Bill crafted custom fitness programs and provided psychological skills training to over 1,000 very different individuals, from professional and college athletes to children as young as ten years old, ninety-five-year-old adults, nuns, musicians, business leaders, teachers, and farmers. From 1995 – 1998, Bill was the physical trainer for the Ohio State women’s soccer team, and mental skills coach for the Muskingum College women’s basketball team. During this period, Bill was also training members of Nautilus Fitness Center and Genesis Fitness Center in Zanesville, Coshocton’s Sports and Courts, and traveling to work with people as an in-home trainer. In 1998, Bill chose historic downtown Zanesville as the location for his own brand of niche fitness center. At present, Bill continues to learn from the people he helps. He actively improves his technique every day, to continue to support his clients on their wellness journeys.